Cake Wrecks - Home - When Gangsters Go "PC"
"Just decoratin' this here Christmas cake, boss." "Bugsy, you can't write "Christmas" there - it's gonna offend somebody! An' don't call me 'boss'." "Sorry, boss. Can I write 'happy holidays'?" "Nah, dat'll offend people who don't celebrate no holidays." "Can I just use red and green icin' and not write nuthin'?" "Bugsy, ya knucklehead, think about it: red and green say 'Christmas', see? S'no good. Use a lotta blue - but not blue and white, mind, 'cause dat's all Hanukkah-like. Maybe try blue and poiple." "Yeah, but what do I write, boss?" "I dunno; Lil' Antony said it's just gotta be 'completely non-offensive-like, says nuthin' of substance, and don't reference no holidays.' Oh, and it can't start wit' 'happy' or 'merry', neither - people might think we're forcing our 'emotional views' on 'em, whatever da heck dat means." Wow, Tanya C., I'm getting filled with the holiday spirit just looking at this. I think the underline really sells it, don't you? Maybe that's a really short haiku? that is EXACTLY how the conversation went down, I'm sure of it! Hang on, what about me? I live in Australia... that offends me because it's stinking-hot SUMMER here! You know... *chocolate* icing is brown. Awesome cake. My jaw dropped. GREAT "Oscar" references! I was laughing outloud! Do they live somewhere there is a drought, or did the decorator get bumped off mid-icing? Well ... it does kind of look like winter in my state, where everything's brown outside and someone puts up a snowman inflatable to make it seem more "seasonal." The commentary was spot-on, as usual. Word verification: lakinse. Incense for the lactose-intolerant. Best laugh of the day so far! love it. One of the best holiday posts this holiday season. I am so glad I read all of the commentary before scrolling down to the picture -- classic! Howse about them cupcakes to the left? I had to get my sunglasses out. LOVE this post! I had this great mental image of the men of the Soprano family standing around the kitchen table in ruffled aprons. Concerning political correctness, I know a teacher who has "Merry Christmas" on her classroom walls in 10+ languages so it is "educational." I have to confess... I actually think this cake is adorable! The snowman is cute, and it's poetic in its barrenness. Not sure WHAT occasion someone would actually buy this for, though. Oh, and the frosting is brown because it's chocolate, yes? Either that, or the cake is set in Chicago. We got a half-foot of snow this morning, and it's already turned into filthy slush. I'll post something Politically Correct when I stop laughing. I read this to my husband out loud (cause I can do voices really well) and we both laughed again. Shouldn't the cake be white, to like, you know, look like winter? "I want 'winter wonderland' in blue." ...which poorly translated into "winter, underlined, in blue." Excellent commentary, excellent (in its badness) cake...say, do you dislike "cookie cakes" as much as you dislike CCCs? BUAHAHAHAHA!!!!... OK...I have to compose myself just to type... I will be giggling to myself about this one for a LONG time! Thanks Jen! I am OFENDED! I grew up in the South Earstern U.S., and we rarely if ever had snow-- even more rare was to have enough snow to build a snowman! This is OBVIOUSLY a plot to exclude anyone in temperate and tropical zones! I DEMAND COMPENSATION!!! the cake was amusing, but the dialogue was hilarious! thanks for the giggle. Guys, it's just chocolate-flavoured butter cream. It is a surprisingly popular icing in my shop. They say that when someone writes in upper and lower case characters indiscriminately, it means they're insane. I totally heard Bugs Bunny while reading your commentary. And the cake is....very....plain? Uninspiring? Blah? Unfinished? Maybe all four? wv: ciagadri. Sounds like an Italian surname. why is there a snowman in the middle of the dessert? This is basically a perfect post. I was amused throughout the 'conversation', and totally guffawed when I saw that cake itself. Perfect! And I thought I was the only one who thought that "Oscar" was genius. This cake is horribly awesome. Seriously: is that a cake, a brownie or a cookie? Look at the sides, it seems to be in some kind of metal pan or something. I'm so confused! Word verification: sessesse. Also confusing. Beyond "all righty then..." there just are no words. Well..maybe the cake decorator is pagan. My husband just survived a round of layoffs at his company. I thought we'd get a cake that says "Congratulations on keeping your job!" As an Australian, I am offended by the impliction that Winter is the only season at this time of year, when we are just getting started with Summer! Maybe they should just go with December? December 20, 2008 | Heather S.
I can't help but think that the request went something like "I'd just like it to say 'Winter' y'know? A snowman would be nice; go with that." I also have 'flu so I can't manage anything that isn't really obvious, sorry. Ha ha ha. This is brilliant. I think I'm more freaked out about the neon yellow, orange, and blue cupcakes to the left of the Winter cake! Oh, and that icing may be chocolate, but it is still grossly poo colored and there would be lots of good jokes around my office - since I work in a GI (Gastroenterology) doctor's office! Where did the gangsters part come from? And the snowman is white, so that makes blue and white. December 20, 2008 | Giusi. December 20, 2008 | Me! I am from the Southern Hemisphere and find this cake extremely offensive. 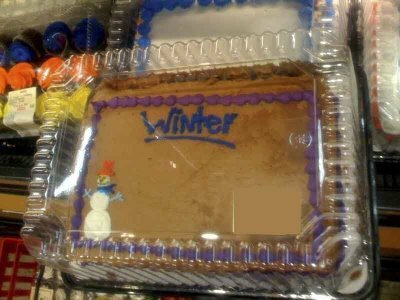 Actually, this cake is still completely and totally politically incorrect, simply for the reason that it is not winter in some parts of the world - including Australia, where I live. This cake does not fully appreciate the needs and requirements of the world community living in the southern hemisphere. But... but... this cake is offensive to people living in the southern hemisphere where it's currently summer! Very funny. I think this may be a case of a mostly unfrosted cake. Maybe that was the goal... for people who don't want alot of frosting. It still looks pretty bad, though. Winter is an odd theme for a brownish colored cake with hardly any decorations. Oh, word verification: peniza... uhuhuhuhuh. Really? Your enjoyment is that fragile? You poor thing. Let me be the first to wish you a Happy Saturnalia, since a generic greeting MIGHT RUIN EVERYTHING!!! May I wish all here a GLAD YULE! Tonight is the solstice, after all! And no, I'm not really being sarcastic. Yule is a source of so much joy to me, and I'm showering everyone with sunny good wishes at this holy tide. Tonight is the all-night vigil we have around a bonfire, with entirely too much "holiday spirit" (in liquid form) and tasty treats and whatnot making the rounds of all the participants. I'd share it all with everyone here if I could! LOL. Poiple! Awesome commentary boss.